This topic contains 6 replies, has 2 voices, and was last updated by Hijac 10 months, 2 weeks ago. Why is the this occurring only on the home page?? HTML and css being scrubbed to plain text in the post grid. Also – is it possible to change the text color from pink? Could you please clarify what you mean by “HTML and css being scrubbed to plain text in the post grid“? Can you let me know your site URL please? The next upcoming update will have option to change the main highlight color used for links, buttons, menu highlighting etc. In the meantime, is there a specfific piece of text that you want to change the color? The issue is that the front end is not updating along with the back end changes. I have purged the cache, opened with different browsers, done a full clear of my cache on each browser but to no avail. Current Issue: Categories are not updating to show corrections. Everything is a ‘retrograde rundown’ category on the front end while the back end is set up properly. 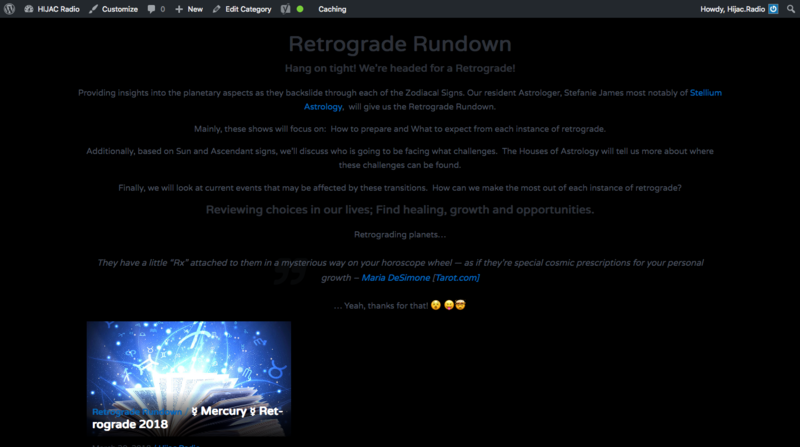 When I view your site, I can see post categories such as ‘Astrology Shows’, ‘Spirituality’, ‘Academic’, ‘Permaculture’ as well as the ‘Retrograde Rundown’ category that you mentioned, so I do not understand the issue with “Everything is a ‘retrograde rundown’ category on the front end”, sorry. If you look at the image I have included as an example, you will see that every show post has a primary category of ‘Retrograde Rundown’. I have tried to update this many times but it is not changing on the front end. I have given it several days in case there is a buffer I am unaware of when you change elements within the theme. I hope this clarifies? On the back end the correct information is viewable. When I go to categories and filter by the ‘retrograde rundown’ only one show post comes up, which is correct. And when I select the ‘Retrograde Rundown’ category and the description page comes up, only the 1 show that is supposed to be under this heading comes up. I need to correct this issue and I am not sure how to clarify it further, I hope the pictures help to explain what the issue is. Do you have the Easy Primary Category plugin installed and activated as detailed in the theme documentation? But deleting it seems to have taken care of the issue. It may be because I am working with a bit of back end code. Thank you for suggesting I look at that plug in, getting rid of it was helpful. The topic ‘Trouble shooting theme’ is closed to new replies.